Use this vanity to bring more traditional style into your bathroom. This piece comes with a beautiful white solid wood base and a white marble counter. Make your bathroom look like new with this good-looking, useful set from Wyndham Collection. Acclaim 80-inch W 6-Drawer 4-Door Vanity in White With Marble Top in White, Double Basins Use this vanity to bring more traditional style into your bathroom. This piece comes with a beautiful white solid wood base and a white marble counter. Make your bathroom look like new with this good-looking, useful set from Wyndham Collection. 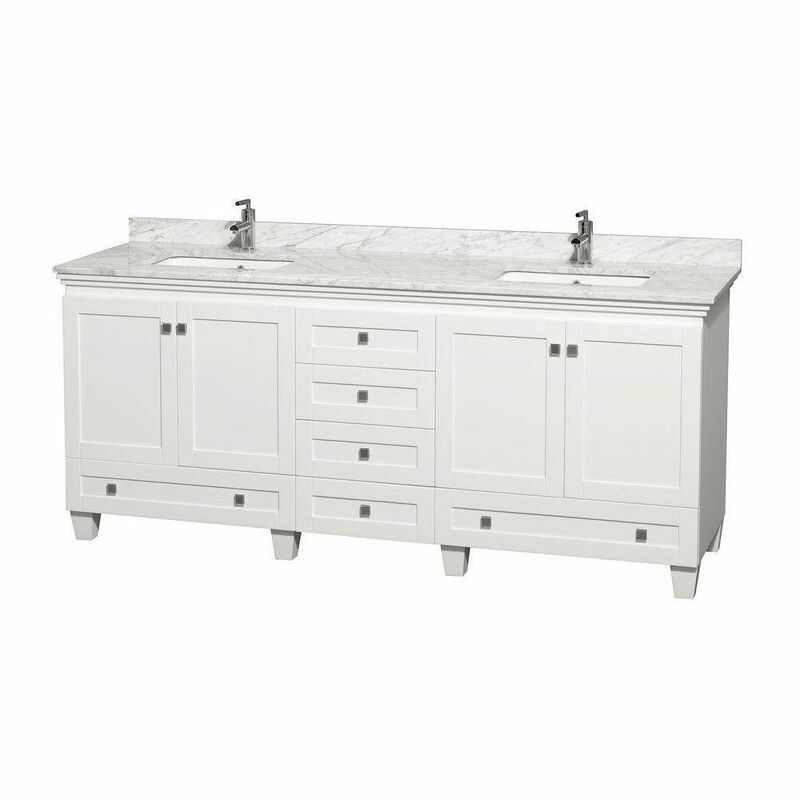 Acclaim 80-inch W 6-Drawer 4-Door Vanity in White With Marble Top in White, Double Basins is rated 4.6 out of 5 by 12. Rated 5 out of 5 by Paulie17 from Great Quality Received this a month ago and all though not installing it yet this a high end look an quality, well worth the money. As previous reviews, this is very large and heavy piece, delivery could not bring in the house as it is in separate boxes all on one skid (box each for counter and unit) Good luck moving it to a 2nd floor. Rated 3 out of 5 by Garmit from OK This is a very expensive unit in our world. having installed it, the sinks and cabinets do not line up correctly so it requires some jimmying to get it close to center. once that is done we had a significant gap at one end to compensate for. a side splash would maybe cover it up. home depot was no help in trying to secure one and calling the manufacture was even less help. would expect a bit more for the money invested. take another look at something other than Wyndham. Rated 5 out of 5 by Mary from Vanity Excellent quality. Love the vanity. We needed a large vanity. It was the perfect size. Could you tell me what size are the sinks? Sylvie, Sink depth 5&quot; 16&quot; L x 18&quot; W thank you.